Young adults are having a particularly hard time in this economy saving money for their future, but they are having no trouble at all racking up large amounts of credit card debt. According to a recently conducted study by Bankrate.com, about one in four Americans report having more credit card debt than emergency savings. Based on the survey, about 32 percent of people between the ages of 30 and 49 said they had more credit card debt than emergency savings, along with 21 percent of those between the ages of 18 and 29 and 14 percent of those 65 years old or older. The survey showed that 13 percent of consumers did not have any credit card debt but had zero emergency savings. Younger consumers face considerable challenges when it comes to trying to build an emergency savings account. Stagnating wages have contributed to the lack of savings for many younger families, as well as coping with increased child care costs, the costs of old student loan debt, and an advertising system that constantly bombards them with more ways to spend money. It can take a year to save up $1,000 if they are only setting aside twenty bucks a week, but it only takes a day to open up a credit card and rack up $1,000 in credit card debt. 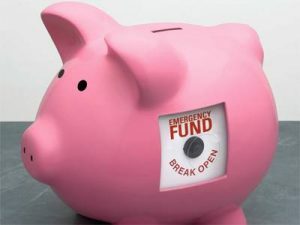 Creating a basic emergency savings plan that contains enough money to cover three months to six months of bills can be as overwhelming as setting a goal to save a million dollars, but it can be done if you are determined to succeed. In many cases, people don’t realize the wide variety of ways that they can use to come up with money for savings. Here are some effective methods you can try. Many young adults report paying for subscription services and memberships on a regular basis. Some of the more trendy subscription services for personalized sample deliveries of beauty, grooming and lifestyle products can easily cost between $20 and $50 per month, much more than you would pay if you simply purchased similar items yourself when you need them. Magazine subscriptions that you rarely read and club or gym memberships that you rarely use can easily be canceled to free up more money for your savings account. You should also set aside part of any large lump sum payment you receive toward emergency savings. If you are scheduled to receive an income tax refund, put at least $200 or $300 into your emergency savings account before starting to spend the rest. People that work in industries that provide annual bonuses should set aside 10 percent to 20 percent of that bonus money for their rainy day savings accounts. If the money remains in the account untouched until you need it for a genuine financial emergency, you will find that your financial position is much more secure and you can avoid racking up expensive debt.